The address book of your iPhone is full of sensitive data that you don't want to lose? You can easily save your iPhone contacts on the PC. 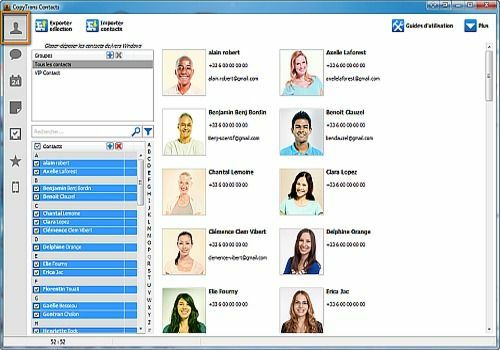 You can also export contacts to Outlook, Gmail, Yahoo, Windows, iPhone, iPod, iPad, Android and BlackBerry. You want to import contacts to a new iPhone? Simply drag and drop contact files from the PC into the iPhone. Keep SMS/iMessages with images, videos and more on the PC, you have the choice between several storage formats such as Word, Excel, plain text, CSV and HTML. CopyTrans Contacts offers you many possibilities. You can back up your sensitive data on the PC or manage different cloud services on the computer through a single user interface. Transferring contacts, calendars and notes between iCloud, Gmail and Yahoo! is child's play. Easily recover lost data on your Android mobile phone, such as messages, contacts, call logs, photos, videos, audio files, WhatsApp, documents, etc. You can back up your iPhone and iPad data to the computer with a single click and restore any object to iOS devices from the backup without any data loss. It allows you to easily extract your contacts, messages, photos, videos, audio, WhatsApp, etc. from blocked or broken Samsung phones / tablets and repair bricked Android phones safely. Efficient, safe and read-only software for data recovery for: Windows computers, hard drives, flash drives, memory cards, USB, cameras and camcorders. XBoft Data Recovery software makes it easy to recover lost files, images, documents, videos, etc. Recover the information you need from deletion, formatting, partition loss, system crashes, etc.